Mezz Mezzrow was born in Chicago in 1899 and was one of that city's most popular clarinetists during the golden jazz age of the twenties. Many of Mezzrow's records reveal his deep feeling for the blues and his playing is characterized by well-thought lines, frequent agility and an appealingly acid tone, but despite touring regularly with various bands and with Louis Armstrong, his most notable contribution to jazz history is his autobiography, Really the Blues, written with Bernard Wolfe, first published in 1946. It is its unbounded vitality that so captures the revolution which jazz represented to the youth of Chicago in the twenties, and even more that of Harlem in the thirties and forties. He learned to play the saxophone in the Potomac Reformatory School where he was sentenced at the age of 16 for car theft. During his late teens he discovered jazz, and went on to emulate the musicians Freddie Keppard, Joe Oliver, Louis Armstrong, Jimmy Noone and many others. He took up the clarinet and so started his life in the jazz world. Mezzrow was adept at both clarinet and tenor, and there are recordings of him in the late 1920’s with the Jungle Kings, the Chicago Rhythm Kings, and Eddie Condon’s band. He played throughout the ‘30’s as a member of various swing bands, which at times included Benny Carter and Teddy Wilson. A highlight of the period for him was his recording in 1938 for French producer Hugh Panassie, which joined him up with his idol Sidney Bechet. Mezzrow was a great admirer of Sidney Bechet and made many recordings featuring himself with Bechet for his own King Jazz label, in the mid forties. Mezzrow’s playing was not by any means in the same league as Sidney Bechet’s, but in light of the recordings made in New York in 1945 and Chicago in ’47, Mezz must get credit for even being in the studio and on the dates with Bechet and some of the major players of the era. 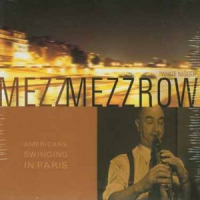 By 1948 Mezzrow had relocated to France, as he was enthralled by the respect given to jazz musicians there, and the vibranrt scene in general. He continued to record quite prolifically throughout the decade of the ‘50’s, on a variety of French labels. He remained a resident of France until his death in Paris on Aug. 2, 1972. All About Jazz musician pages are maintained by musicians, publicists and trusted members like you. Interested? Tell us why you would like to improve the Mezz Mezzrow musician page.